and data mining for grouping data into 'clusters' that exposes similarities or dissimilarities in the data. There are many approaches to hierarchical clustering as it is not possible to investigate all clustering possibilities. One set of approaches to hierarchical clustering is known as agglomerative, whereby in each step of the clustering process an observation or cluster is merged into another cluster. 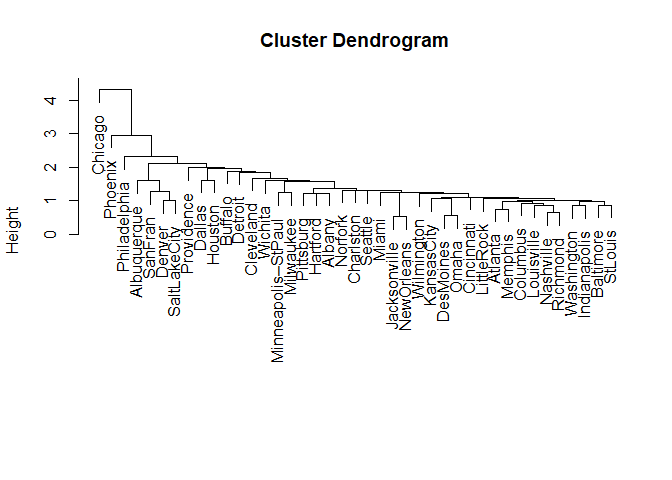 Hierarchical clustering is a widely used and popular tool in statistics and data mining for grouping data into 'clusters' that exposes similarities or dissimilarities in the data. There are many approaches to hierarchical clustering as it is not possible to investigate all clustering possibilities. One set of approaches to hierarchical clustering is known as agglomerative, whereby in each step of the clustering process an observation or cluster is merged into another cluster. The first approach we will explore is known as the single linkage method, also known as nearest neighbors. Although recommended by many authors, the question of scaling in the context of hierarchical clustering (particularly using the Euclidean distance measure) is not so black and white (Rencher 2002, pp. 454). The variables that best separate clusters might not do so after scaling. We will scale the pollution data because the variables' scale of measurement is quite different from each other, but it should be noted standardization should be thoughtfully applied (or not applied) rather than proceeding to scale automatically. As the resulting matrices are \(41 \times 41\), check the first and bottom three rows of each to verify. Begin with disjoint clustering with level \(L(0) = 0\) and \(m = 0\). Stop if all \(N\) observations are in one cluster, otherwise repeat starting at Step 2. Although hierarchical clustering with a variety of different methods can be performed in R with the hclust() function, we can also replicate the routine to an extent to better understand how Johnson's algorithm is applied to hierarchical clustering and how hclust() works. To plot our clustering results, we will rely on one output of the hclust() function, the order value, which is purely used for plotting. 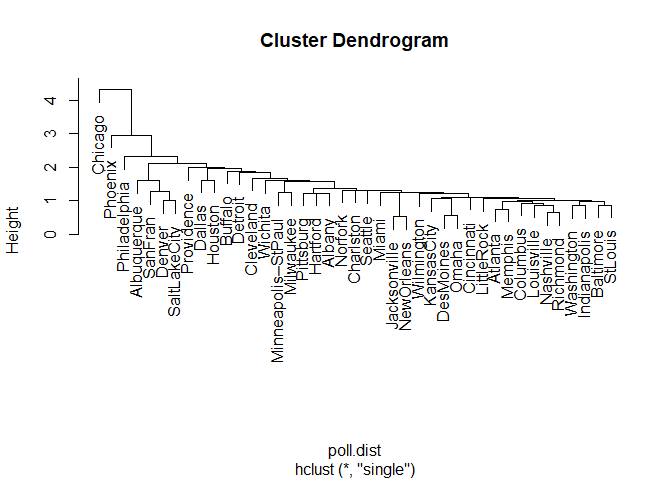 To plot and compare our clustering results, the best method (that I know of) is to create an hclust object, which according to ?hclust, requires merge, height and the aforementioned order components. merge is an n-1 by 2 matrix. Row i of merge describes the merging of clusters at step i of the clustering. If an element j in the row is negative, then observation -j was merged at this stage. If j is > positive then the merge was with the cluster formed at the (earlier) stage j of the algorithm. Thus negative entries in merge indicate agglomerations of singletons, and positive entries indicate agglomerations of non-singletons. Order is a vector giving the permutation of the original observations suitable for plotting, in the sense > that a cluster plot using this ordering and matrix merge will not have crossings of the branches. The row and column names of the distance matrix are set to \(-1\) increasing up to \(-N\), which allows us to note if the merged cluster at a particular step was an individual cluster. Moving left to the right along the x-axis, we see there Chicago, Phoenix, and Philadelphia are separated from other cities to a decreasing degree. Otherwise, there isn't too much distinction between clusters. At the height of slightly more than two we have a three cluster solution (counting the number of lines crossed going left to right on the x-axis), but the third cluster would contain the bulk of the cities and thus isn't particularly useful. Using a lower height increases the number of clusters significantly, for example, a height of about 1.9 gives a six-cluster solution. However, the final cluster still contains a large amount of the cities and therefore isn't very descriptive of how the cities group themselves. This lack of separation in the clusters might indicate there isn't too much variation in the cities' pollution levels to begin with, the method of clustering used, or a combination of the two. The former point is further evidenced by small distances in the y-axis between many of the clusters. We will see in later posts if using a different distance measure or clustering method improves the clustering of the cities. The hierarchical cluster could be 'cut' to the number of groups we are interested in, but since the clustering isn't that great, we will save this step once for when a better clustering and distance method are used. It should be noted there is no clear 'best' clustering method and often a good approach is to try several different methods. If the resulting clusters are somewhat similar, that is evidence there may be natural clusters in the data. Many studies, however, conclude Ward's method and the average linkage method are the overall best performers (Rencher, 2002, pp. 479). Murtagh, F. (n.d.). Multivariate Data Analysis with Fortran C and Java. Queenâs University Belfast.